Postures that are grounding, calming and slightly heating are important for us Vatas to feel more balanced. Here is a guide to Vata-friendly yoga stretches. 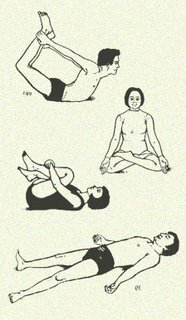 These poses also help constipation, joint pain, backache and circulation. All postures should be performed calmly while doing deep, quiet breathing through the nose. I like the one where you get to lie down, yay for being part vata!